Everyone who knows me well know that I love masks. This can be seen through my vast collection of masks or the fact that I talk about them often. Especially if I find a new mask that I really love. I don't just love one type of masks, although I do have a soft spot for sheet masks. Whether it's clay masks, jelly masks, wash-offs, sheet masks, pudding masks, and the list goes on; if it is a mask of some sort, it's either been tried by me or it is on my list of masks to try. Late last year, I got the Insobeau Multi Complex V-Line Repair Sleeping Mask in my Pumpkin Pie Cosmetics box from Memebox. Its long name made the product sound interesting and since I am always looking to test masks out, I decided to rotate it into my routine after it went through my week long patch test. After all, if it means discovering my next favorite sleeping mask, than I am all for the extra work! 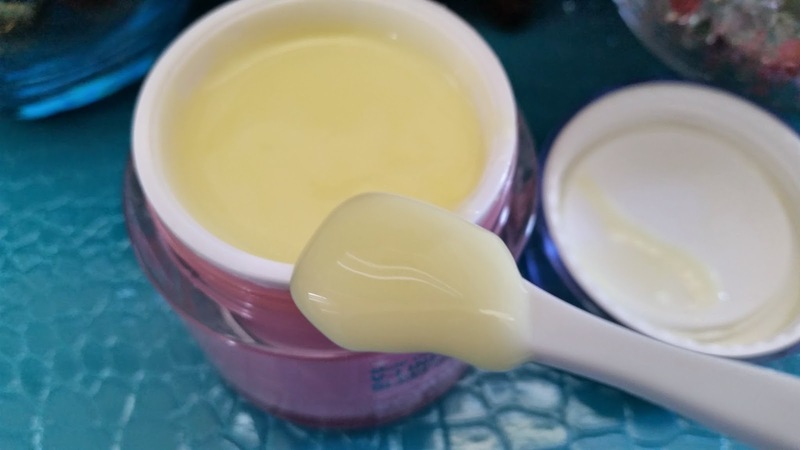 Product Description: A sleeping mask with a buttery yellow formula that resembles egg yolks. It contains rich nutrients and protein from its egg complex. The sleeping mask has minimal stickiness and melts into skin quickly. It is great at revitalizing dry and tired skin overnight. It's got a blend of adenosine, peptide, argan oil, collagen, albutin, and ceramide; all of which works to deliver intense moisture to firm and brighten the skin complexion. To use, spread the mask evenly over clean face. Chill for 20 to 30 minutes to allow the pack to fully absorb before going to bed. The sleeping mask can be used 2 to 3 times a week. My Thoughts: I expected great things for a sleeping mask with a $42 price tag. Since I have sensitive skin, the first thing I did, before I even started to patch test, was to hunt down Insobeau's website. 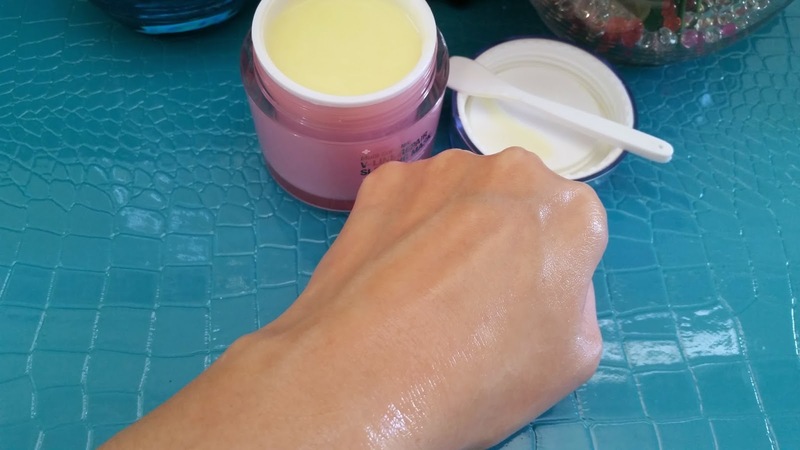 I wanted to find out any and all information on this Multi Complex V-Line Sleeping Mask and its ingredients (in English) before I even try to patch test it. The website was easy to find, however, the ingredients were in Korean which meant getting help from Google Translate. (By the way, Insobeau seems to have upgraded this product. On their website the product is only 35 000 won, which is a little less than $35 but the size is a little smaller, 50ml instead of 80ml.) Google Translate was not working well, so I had to try a couple of other sites, which didn't work that great either. I eventually translated each ingredient individually, which took forever (over an hour). There could be some errors in my translations but it was the best I can do. You can find the ingredients list below. Egg yolks would not be the words I use to describe this sleeping pack. It looks more like egg pudding gone wrong. Or just a light yellow colored pudding of some sort. Personally, I was not found of the look of the product or its texture. What was interesting about the texture of this sleeping mask is that no matter where or how you scoop out some masks, the remaining masks always form back into a flat top shape. It's like a memory foam kind of deal where the mask fills up the gap left by the scooped out product. I thought that was unique. 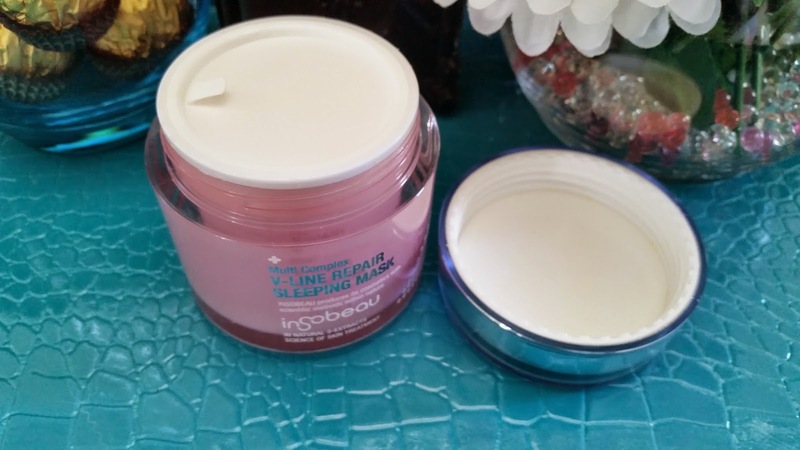 The scent of this Insobeau Multi Complex V-Line Repair Sleeping Mask did throw me off. Since they mentioned eggs, egg yolks/ egg pudding, I thought it would smell sort of like sweet egg pudding. Nope, I was wrong, it doesn't smell like anything near what I thought it would. Instead, the smell reminds me of Dove or Olay soap. A floral fragrance that isn't too strong but still very noticeable. It took me a couple of tries before I found the right amount of product to scoop out each time. When I was patch testing the product I always scooped out too much. A little goes a long way for this sleeping mask. While I like to apply on a thickish layer for most sleeping masks, I find that for this one I like to keep it as thin as possible. The formula melts right into your skin, which is great. However, what's not so great is the oilyness left behind. It's not sticky, just oily; which I did not like at all. Although the masks promises to firm up the skin and brighten it, I didn't see any long lasting effects. My skin did look a litter brighter after application but it was not a big change and it did not last long. I can't say I saw much of the firming either, which was disappointing. I have stopped using this mask now, mainly because it has an expiration date of June 2015. It was one of the few products Memebox sent out that had a less than 1 year expiration date. I was not pleased with that, however, since this has nothing to do with Insobeau and is a mishap on Memebox's part, I won't take the early expiration date into consideration when I rate this product. Another reason why I stopped using this mask is the oilyness it leaves behind. Since I already have combo to oily skin, I don't really like the additional oily feeling left on the skin by this mask. Final Thoughts: I secretly hoped that this Insobeau Multi Complex V-Line Repair Sleeping Mask would be awesome enough for its hefty price tag, but alas, it was not. At least not for me. There were many issues with this sleeping masks. First is the promised firming and brightening effects that wasn't really effective. Then the added oilyness feeling that was unpleasant for me. Finally, the bar soap like scent that made this product smell cheap, plus the odd looks and texture of this product made it an interesting mask, but just not for me. I was happy to find that this mask did not break me out, despite the extra oilyness. If you have combo to oily skin types and you do not like oily feelings on the skin, than you might not like this sleeping mask. I'm not sure if this mask would work better for normal to dry skin types either, because my mom (the other writer on DTC) does not like this sleeping mask either. 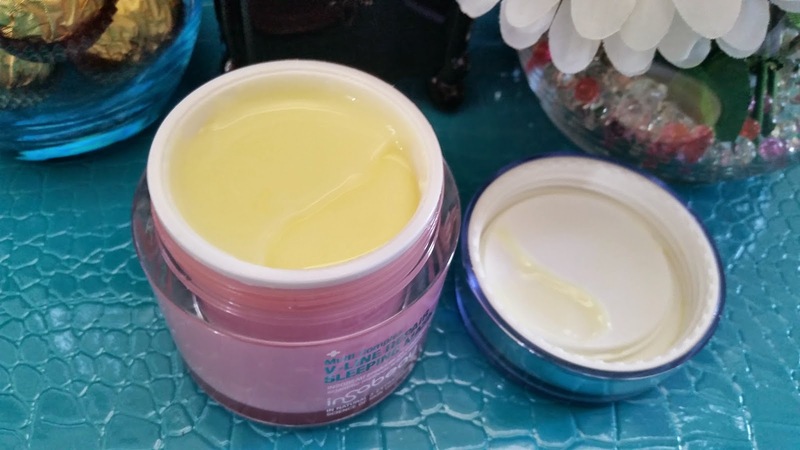 Even though she loves heavy creams, sleeping packs, and facial oils, she just did not like how this mask felt when she applied it. Plus she's not a fan of the extra oilyness that never seems to be absorbed by the skin. I would think that personal preference plays a big role for this sleeping mask. For my mom and I, this sleeping mask just wasn't right for us or our skin. There was 1 positive for this sleeping mask and it has nothing to do with its formula but everything to do with its packaging. Although not pictured, the top of this container has a dual layer. An inner layer with a reflective mirror like material and an outer layer with a plastic encasing. What this does is that it allows the top of this container to function like a mirror. It's quite handy I think, especially if you don't have another mirror on hand. It's clear to see that I won't be purchasing this product in the future. While browsing on Insobeau's website, I did find some other products that I might be interested in. I won't let one product's negativity deter me from trying other products from the same brand, however, I will be very careful with it. 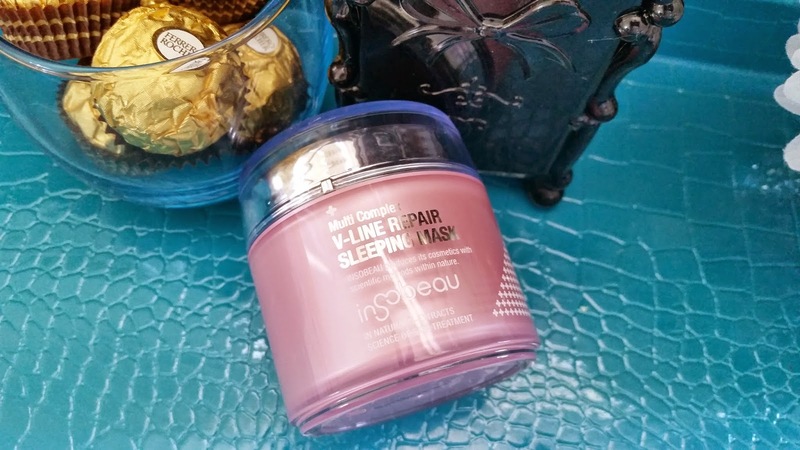 Have you tried Insobeau's Multi Complex V-Line Repair Sleeping Mask or any of Insobeau's other products? What are your thoughts on it? Disclaimer: This products were purchased by me with my own money, all opinions are honest and my own.